What Do Dark Skies Mean to You? Home » Light Pollution » What Do Dark Skies Mean to You? 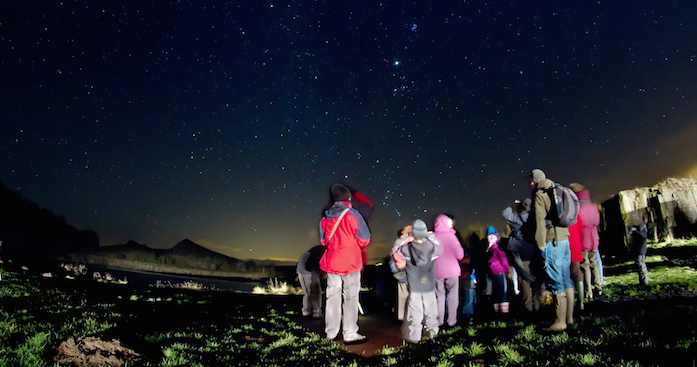 Stargazing at Northumberland National Park in England, an International Dark Sky Park. Photo by Cain Scrimgeour. When was the last time you experienced a truly dark, star-filled night sky, even in the countryside? Or saw the beauty of the Milky Way clearly? For me, it was quite some time ago. I used to go youth hostelling a lot as a child, often in remote places, and I vividly recall a stay in Wheeldale Youth Hostel, in the North York Moors National Park. It was late evening and we ventured outside the hostel to see how different the night sky was compared with back home. For a child who grew up in West London, that absolute darkness of a star studded sky was quite a shock to me. I think that there are many children nowadays who are so used to living under the constant glow of light pollution that they too would be astounded by a truly dark night sky. My own childhood experiences are what inspires me to fight for our countryside, so that future generations can enjoy it as I did. So when the opportunity came up to develop new maps of England’s night skies, I felt this would be vital evidence in CPRE’s campaign against the light pollution that blights our lives. Recently, we published the most detailed maps ever of England’s light pollution and dark skies, using satellite data captured at 1:30 a.m. throughout September 2015. We worked with consultants LUC to create an interactive map of Britain, along with detailed maps of English districts, counties, National Parks, Areas of Outstanding Natural Beauty and, at a wider scale, National Character Areas. Our maps show the varying light levels around the country, which were split into nine categories, and will help to identify sources of light pollution to be tackled. They also help to identify the existing dark skies that need to be protected and improved. The maps show that only 22 percent of England has pristine night skies or, in other words, are completely free from light pollution. When the two darkest categories are combined, almost half of England (49 percent) has what many of us would regard as dark skies. We’ve found that National Parks and Areas of Outstanding Natural Beauty (AONBs) play a vital role in protecting dark skies, with 53 percent of England’s very darkest skies above these places. For example, the Northumberland National Park has 96 percent pristine night skies, much deserving of the International Dark-Sky Park status that it was awarded in late 2013. The North York Moors National Park, as mentioned earlier, has 71 percent pristine night skies – no wonder it was such a contrast to the London borough of Hillingdon, where I grew up, which has none of its night skies in the darkest three categories. You may not be surprised to hear that 19 of the brightest 20 districts are London boroughs, with Manchester the only area bucking the trend. As for the darkest districts, ten of the top 20 are in the South West, with the Isles of Scilly and West Devon leading the way, followed by Eden in Cumbria. You can find out more in CPRE’s report Night Blight: Mapping England’s light pollution and dark skies. Light pollution is a problem that can be solved. CPRE would like to see local authorities develop policies in local plans to control light pollution, which ensure that existing dark skies are protected and that new developments do not increase local light pollution. The maps can also be used to identify light pollution and target action to reduce it. We’ve also developed lesson plans for primary school children, which will be particularly relevant for children living in urban areas who may not have had the opportunity to see a dark starry night sky due to light pollution. We can all do something to help reduce light pollution, and you can find out how to take action on our dedicated website, where you’ll find the maps and all our resources which will help you tackle local light pollution. As for me, I’m looking forward to taking my family off to Devon in a few weeks and seeking out a good view of the stars and, I hope, wondering at the Milky Way, our own galaxy, spread across the night sky. Emma is a rural policy specialist in our campaigns team and works on some of the most treasured features of our countryside like National Parks, Areas of Outstanding Natural Beauty and landscape issues. She also leads CPRE work on the protection of trees and hedgerows and our campaign to curb intrusive light pollution. Her specialist areas include National Parks, AONBs, trees, hedgerows, light pollution and polytunnels. This post was first published on the CPRE blog. A big Thank You to CPRE for letting IDA republish this article!